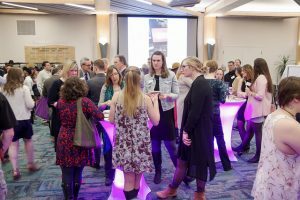 Champlain College’s Division of Communication and Creative Media (CCM) celebrated the success of its stellar students during a celestial-themed Honors Night held Thursday, April 19. The annual event honored 40 students representing ten of the academic programs who were recognized for their outstanding academic achievement, creativity and significant contributions to their programs, the division or college, in addition to a high grade point average. Honors Night 2018 celebrating the accomplishments of CCM Division stellar students. The division awarded $1,000 CCM Dean’s Scholarships to outstanding students in each of the nine undergraduate majors to be used toward next Fall’s tuition and other educational expenses. Nine graduating seniors and a graduating MFA student were honored with a CCM Excel Award. The Excel Award recognizes an outstanding graduating senior in each of the undergraduate majors and in the graduate program who have shown evidence of studying abroad, completing one or more internships, or significantly engaging with their discipline or community beyond the classroom. This year, Honors Night also announced the inauguration the Champlain College Alpha Epsilon Eta chapter of Lambda Pi Eta, the official honor society of the National Communication Association. Eleven Communication and Public Relations majors were inducted into the society with honor cords and pins. Dean Paula Willoquet-Maricondi and Dr. Cheryl Casey congratulate Lambda Pi Eta members Jade Ye, Christine Tibert, Alex Swanson, Melanie Orcutt, Bessie McManus, Monique Lavallee, Brooke Barwick and Danielle Adams. Five Broadcast Media Production majors received scholarships from the Vermont Association of Broadcasters (VAB) and were greeted on stage by special guest Wally Caswell who is the current VAB president. Two Filmmaking majors were winners of the Stowe Story Lab Fellowships and were greeted on stage by David Rocchio, founder. The CCM Dean’s Choice Award for the Juried Student Art Show was presented by Dana Heffren, Director of the Champlain Art Gallery and organizer of the college’s Juried Student Art Show. “The accomplishments of our CCM students are truly exemplary. Honors Night is an opportunity to publicly recognize and celebrate their talent and hard work as they continue to prepare to lead gratifying and meaningful lives and careers,” says Paula Willoquet-Maricondi, Dean of CCM. 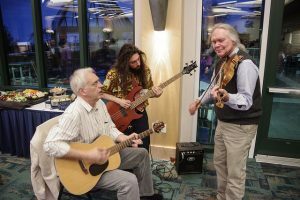 The Cave Dogs Tim Brookes, Daniel Siegal and Jim Ellefson celebrate honors students and their guests with musical entertainment during the Honors Night Reception. 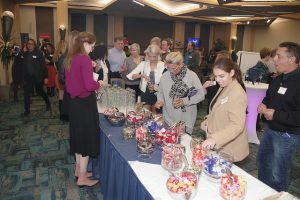 After the program, students and guests fill up souvenir pint glasses at the candy bar during the Sirius Sweets Celebration. Charles Dalgleish – Broadcast Media Production Sophomore; Jessy Moyer – Communication Junior; Sofia Darovskikh – Creative Media Junior; Roger Castillo – Filmmaking Sophomore; Jennifer Carlin – Game Art & Animation Junior; Zachary Phillips – Game Design Sophomore; Daphne Plante – Graphic Design Junior; Grace Safford – Professional Writing Sophomore; Alayna Masker – Public Relations Junior. Lambda Pi Eta Inductees: Danielle Adams, Brooke Barwick, Joseph Couture, Monique Lavallee, Bessie McManus, Melanie Orcutt, Gare Reid, Margaret Stevens, Alex Swanson, Christine Tibert, Jadelynn Ye. Corinna Baciak, Junior; Julia Leonard, Sophomore; Olivia Lyons, Junior; Harold (Luke) Marcheski, First Year; Alex Sabatell, Junior.